My swordfish memories go back to summer vacations in Cape Cod. We spent most of our time enjoying the water with our kids, but one night of the week we were always able to escape and have dinner at a “real restaurant” with cocktails and adult conversation. One of the best meals I had was fresh grilled swordfish topped with this marvelous anchovy butter. If you’ve followed my blog, you should know by now that anchovies are one of my favorite ingredients, so you can imagine how I adored this fish. I stopped by our fish market recently to find something for dinner and was happy to see fresh swordfish steaks in the display case. I grabbed two beautiful steaks and headed home to create something yummy. Knowing most of you don’t share my infatuation with anchovies, I decided to make this with a Mediterranean twist. 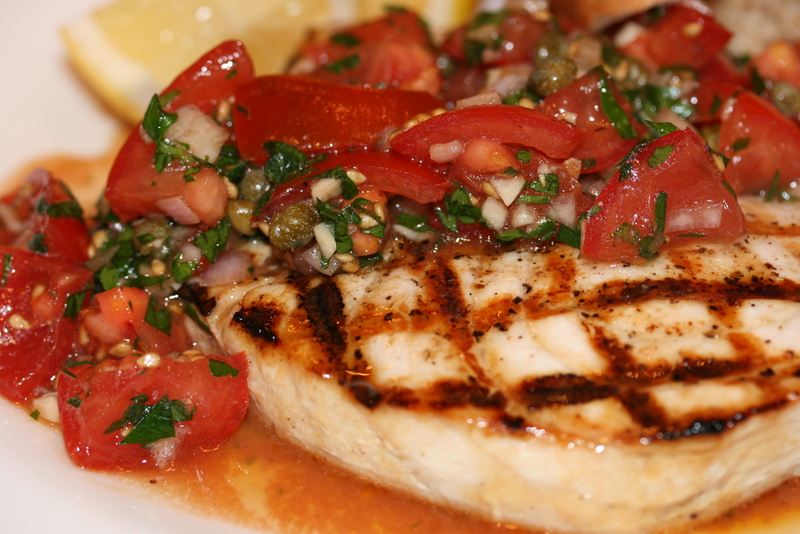 The intensely flavorful combination of juicy tomatoes, capers, shallots and herbs contrast perfectly with the grilled fish. Rub both sides of the fish with a little olive oil, sprinkle with salt and pepper and squeeze over a little fresh lemon juice. Place in the refrigerator for 30 minutes. Heat your grill. Grill the swordfish steaks about 4 minutes per side or until cooked through. Place all the ingredients in a bowl and stir together. Let sit at room temperature to marinate for about 30 minutes or up to an hour. The tomatoes will begin to release their juices. Taste for reseasoning with salt and pepper before serving. Keeping in mind that capers are salty, so be careful with the salt. Spoon the relish over the grilled fish. Serve with fresh lemon wedges and a hunk of baguette to soak up all those delightful juices left behind. Fantastic. I’ve never tried swordfish, but I must. It’s one of my favorites! I think it’s best grilled. You should give it a try.